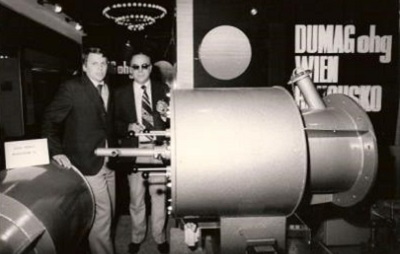 DUMAG acquires the patent for the ultrasonic nozzle, which atomizes fuel according to the principle of Hartmann’s generator. First attempts towards the industrial application of the DUMAG nozzle and continuous further development. The conception is radically changed after Heinz Haberfelner took over control over technical management. The ultrasonic nozzle and the burner system developed based on it attained a resounding success, especially for highly viscous heavy oils and contaminated waste materials. Several patents are granted. The invented ultrasonic atomization with a variable type of spraying allows flames to be shaped. This invention is the basis for today’s universal and flexible use of industrial burners. The development of gas lances as a slide-in charging pipe or sleeve tube inserted into the burner enhances these burners to act as multi-functional burners for burning gaseous and liquid fuels in conjunction with gaseous and liquid waste materials. Development of sulfur spraying using the ultrasonic nozzle in cooperation with Davy McKee and Technical University of Karlsruhe. Successful applications in the production of sulfuric acid are the basis for the development of DUMAG sulfur burners. First successful use of a burner having a pre-combustion chamber for gas/solvent/water in a commercially available thermal oil burner. Based on several research grants, a Low-NOx burner constructed as a three-flow burner with internal flue gas recirculation is developed. These burners were successfully used from 2005. Ongoing development of the COMOFF system. 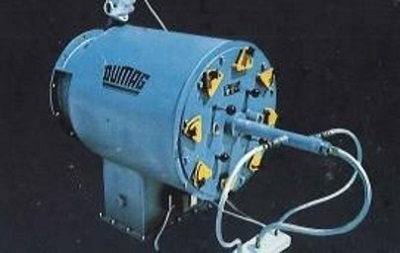 This is a modular system that may be used in any combination applying the DUMAG elements nozzle/gun/burner/RVT/pre-combustion chamber/additional lances for the combined combustion of gaseous and liquid fuels / gaseous and liquid waste materials / gaseous and liquid alternative fuels as well as for offgases, exhaust air etc. Heinz Haberfelner resumes work in development and technical management. Development of the new ultrasonic nozzle series. Significant improvement of control range, flame stability, reduction of sensitivity to erosion, reduction in pressurized air throughput. Simple change of flame shape from jet shape to tulip shape or vice versa and thus simplified start-up. Development of a gas ring distributor RVT as a burner extension. This development resulted from the need to be able to co-incinerate major amounts of lean gas, offgases and the like. Through research grants, the development of big nozzles is initiated. They are primarily intended to be used for burning sulfur and achieve throughputs of 30 tons per hour. This research work also includes the development of the ultrasonic oxygen nozzle for burning fuel oils or liquid waste using 100 percent oxygen. It enables attaining high performance increases in annealing or during melting processes in recycling industry or increases in performance in the combustion of liquid wastes. 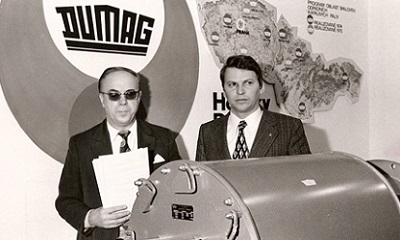 Foundation of CTP-DUMAG GmbH. Robert Schröger and Heinz Haberfelner take over DUMAG’s immaterial assets together with CTP. Acquisition of all comapny shares by the management, corporate name change to DUMAG GmbH.